Do you have trouble sleeping? Or do you wish you could have a perfect night's sleep every night? 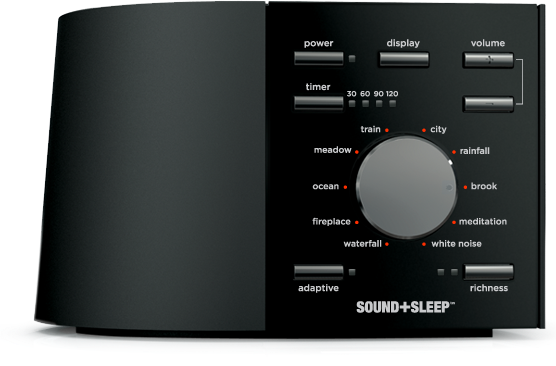 Then look no further than my new favorite toy - the Sound + Sleep - Ultimate Sleep Sound Therapy System! This sound machine is easy to use and can really help you to sleep better. My husband and I have been using this machine almost every night for about a month. It's funny because during this period, we lost power for a few days and couldn't use it - and we totally noticed the difference! 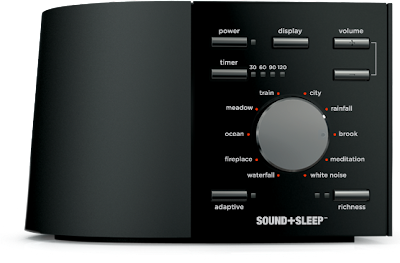 The Sound + Sleep machine has some smart features: one, you can set the sounds to four different sleep timers (with automatic or gradual turn off), and you can also turn the display lights off (while the machine is still running). The machine has ten "sound-story" settings: waterfall, fireplace, ocean, meadow, train, city, rainfall, brook, meditation, and white noise. All are great but our favorites are the ocean, fireplace & the waterfall. The sound-stories are long and varied - so you won't hear the tracks changeover or loop. "Unlike competing sound machines, SOUND+SLEEP plays high-quality, lengthy, and primarily natural sound recordings. This reduces the annoying repetition of short sounds and the irritation of poor-quality, short or synthesized recordings that can actually raise stress and disrupt sleep. ... For example, the Rainfall SoundStory is augmented by various thunderclaps, wind sounds and more. SOUND+SLEEP measures the ambient sound in a room using its built-in microphone to determine the appropriate mix of sounds to play. ASTI calls this real-time sound composition. " Verdict: My husband and I love the Sound + Sleep - Ultimate Sleep Sound Therapy System and recommend it to anyone who wants to have a great night's sleep every night! It can be a calming sleep aid for adults, children and even babies! And the Sound + Sleep isn't just for night time - it can be the perfect background noise to block out all those annoying noises: loud roommates, barking dogs, road noise and more! I've never tried a sound machine but I hear such great things about them. I trust you that they work. I'd love to find out for myself. I liked S+S on Facebook! i liked to your giveaway on my blog but you are my only follower so I don't know if that counts lol. I would love something to help me sleep- this sounds swesome! I would love to win this for my son's nursery - when he sleeps better, we all do! i like sound plus sleep on facebook. looks awesome!